It was my intention to blog about the next item on my plan to awesomeness, but unfortunately, I’m exhausted. I am beat from beets. As I have mentioned before, I am not a big fan of beets. Despite this, I am confronted with them on a fairly regular basis by way of my CSA boxes. The first time I received beets, I made Golden Beet Soup with Crème Fraiche. I thoguht it was okay, but it was still too “beety”. Duh, Alexa. It’s beet soup. This time, as you can see above, I made borscht. 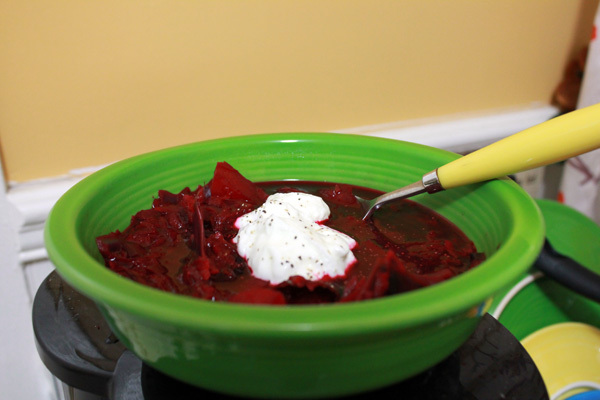 I had never had borscht before, given my aversion to beets. Since I had already given the beets from my boxes away the last TWO times they were part of my selection, I knew I needed to try making something with them this time. This last week a recipe for “Sweet & Sour Borscht” (adapted from the Sunset Vegetarian Cookbook) was provided with my box. I figured I’d give it a go. Spray the bottom of a large pot with olive oil. Add onions cook until they become tender and translucent. Add beets, potatoes, cabbage, broth, water, lemon juice and sugar. Bring to a boil, then reduce to a simmer and cover. Cook until vegetables are tender (approx. 45 min.) Salt and Pepper to taste. The original recipe called for carrots. I didn’t have any, but they would’ve been a nice addition. Also, the original recipe called for either coarsely chopped beet tops (or chopped swiss chard or kale). I had no beet tops, had already eaten my bunch of swiss chard and am saving my kale for something else, so I omitted the extra greens. In retrospect, they also would’ve been a good addition. Despite my aversion to beets, I did have a bowl of the borscht. The above bowl, to be precise. I topped it with some nonfat greek yogurt and some additional pepper. I would confess that this is the best preparation of beets I’ve had so far. Perhaps it was the fact that it was my own blood, sweat and tears that produced the meal. Literally. I grated my finger open, cried when slicing the onion and I was definitely in the need of a shower after all of that beet shredding. That’s right people, I did it by hand. It was quite the unexpected workout! Anyway, I don’t know if I would call myself a beet fan, but this soup will do. Especially if you dump crumbled saltines in it! Not that I would do such a thing…. 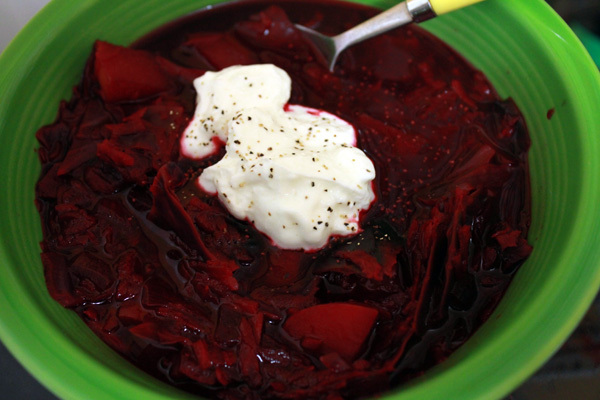 Have you ever made borscht? What goes in your recipe? I think I will try this… 🙂 Thanks for sharing! P.S. Do you remember how many beets you used? Does 3-4 cups come from 3-4 beets? so happy to find this! i received beets with tops from my CSA. i have a copy of the Sunset Vegetarian cookbook which is inaccessible to me right now and was despairing as to how i was going to make this borscht. thanks for posting!